Musings on Markets: DCF Myth 1: If you have a D(discount rate) and a CF (cash flow), you have a DCF! DCF Myth 1: If you have a D(discount rate) and a CF (cash flow), you have a DCF! Earlier this year, I started my series on discounted cash flow valuations (DCF) with a post that listed ten common myths in DCF and promised to do a post on each one over the course of the year. This is the first of that series and I will use it to challenge the widely held misconception that all you need to arrive at a DCF value is a D(iscount rate) and expected C(ash)F(lows). In this post, I will take a tour of what I would term twisted DCFs, where you have the appearance of a discounted cash flow valuation, without any of the consistency or philosophy. Equity versus Business (Firm): If the cash flows are after debt payments (and thus cash flows to equity), the discount rate used has to reflect the return required by those equity investors (the cost of equity), given the perceived risk in their equity investments. If the cash flows are prior to debt payments (cash flows to the business or firm), the discount rate used has to be a weighted average of what your equity investors want and what your lenders (debt holders) demand or a cost of funding the entire business (cost of capital). Pre-tax versus Post-tax: If your cash flows are pre-tax (post-tax), your discount rate has to be pre-tax (post-tax). It is worth noting that when valuing companies, we look at cash flows after corporate taxes and prior to personal taxes and discount rates are defined consistently. This gets tricky when valuing pass-through entities, which pay no taxes but are often required to pass through their income to investors who then get taxed at individual tax rates, and I looked at this question in my post on pass-through entities. Nominal versus Real: If your cash flows are computed without incorporating inflation expectations, they are real cash flows and have to be discounted at a real discount rate. If your cash flows incorporate an expected inflation rate, your discount rate has to incorporate the same expected inflation rate. Currency: If your cash flows are in a specific currency, your discount rate has to be in the same currency. Since currency is primarily a conduit for expected inflation, choosing a high inflation currency (say the Brazilian Reai) will give you a higher discount rate and higher expected growth and should leave value unchanged. I am not suggesting that these relationships always have to hold, but when you do get an exception (high growth with low risk and low reinvestment), you are looking at an unusual company that requires justification and even in that company, there has to be consistency at some point in time. 3. Narrative consistency: In posts last year, I argued that a good valuation connected narrative to numbers. 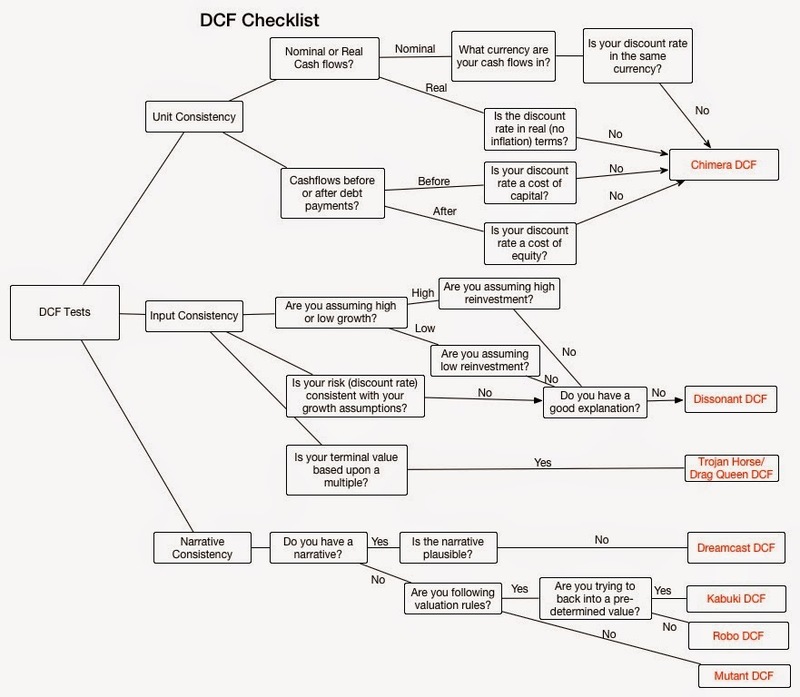 A good DCF valuation has to follow the same principles and the numbers have to be consistent with the story that you are telling about a company’s future and the story that you are telling has to be plausible, given the macroeconomic environment you are predicting, the market or markets that the company operates in and the competition it faces. The Chimera DCF: In mythology, a chimera is usually depicted as a lion, with the head of a goat arising from his back, and a tail that might end with a snake's head. A DCF valuation that mixes dollar cash flows with peso discount rates, nominal cash flows with real costs of capital and cash flows before debt payments with costs of equity is violating basic consistency rules and qualifies as a Chimera DCF. It is useless, no matter how much work went into estimating the cash flows and discount rates. While it is possible that these inconsistencies are the result of deliberate intent (where you are trying to justify an unjustifiable value), they are more often the result of sloppiness and too many analysts working on the same valuation, with division of labor run amok. growth to get its revenues to $350 billion in ten years (about $100 billion higher than Toyota or Volkswagen, the largest automobile companies today), increase operating margins to 10% by the tenth year (giving it the margins of premium auto makers) and make it a low risk, high growth company at that point (allowing it to trade at 20 times earnings at the end of year 10), all on a spreadsheet. Dreamstate DCFs are usually the result of a combination of hubris and static analysis, where you assume that you act correctly and no one else does. dissonance. 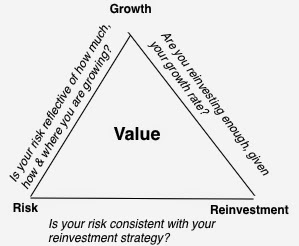 An analyst who assumes high growth with low risk and low reinvestment will get too high a value, and one who assumes low growth with high risk and high reinvestment will get too low a value. I attributed dissonant DCFs to the natural tendency of analysts to focus on one variable at a time and tweak it, when in fact changes in one variable (say, growth) affect the other variables in your assessment. In addition, if you have a bias (towards a higher or lower value), you will find a variable to change that will deliver the result you want. beyond the terminal year, growing at a constant rate forever (or for a finite period) and the second is to assume liquidation, with the liquidation proceeds representing your terminal value. There are many DCFs, though, where the terminal value is estimated by applying a multiple to the terminal year’s revenues, book value or earnings and that multiple (PE, EV/Sales, EV/EBITDA) comes from how comparable firms are being priced right now. Just as the Greeks used a wooden horse to smuggle soldiers into Troy, analysts are using the Trojan horse of expected cash flows (during the estimation period) to smuggle in a pricing. One reason analysts feel the urge to disguise their pricing as DCF valuations is a reluctance to admit that you are playing the pricing game. sense of what they want as output from this process (and it has little to do with fair value), and there are generally no transactions that ride on the numbers (making them "show" valuations), you get checkbox or rule-driven valuation. In its most pristine form, these valuations are works of art, where analyst and rule maker (or court) go through the motions of valuation, with the intent of developing models that are legally or accounting-rule defensible rather than yielding reasonable values. Until we resolve the fundamental contradiction of asking practitioners to price assets, while also asking them to deliver DCF models that back the prices, we will see more and more Kabuki DCFs. neither a narrative holding the numbers together nor a sense of the basic principles of valuation. In the best case scenario, these valuations never see the light of day, as their creators abandon their misshapen creations, but in many cases, these valuations find their way into acquisition valuations, appraisals and portfolio management. You are welcome to borrow, modify or adapt this flowchart to make it yours. If you prefer your flowchart in a more conventional question and answer format, you can use this checklist instead. So, take it for a spin on a DCF valuation, preferably someone else's, since it is so much easier to be judgmental about other people's work than yours. The tougher test is when you have to apply it on one of your own discounted cash flow valuations, but remember that the truth shall set you free! If your DCF value changes significantly over time, there is either something wrong with your valuation. In your post, you mentioned that "If your cash flows are in a specific currency, your discount rate has to be in the same currency", in which case, how would you determine an appropriate discount rate for a company that has significant amount of earnings offshore (such as MSFT or GSK), would you be looking at taking a weighted average of the WACC for each currency or use some other approach? "If your cash flows are in a specific currency, your discount rate has to be in the same currency"
Lets say the firm that I am valuing is in Brazil and sells 90% of its goods in Brazil and the rest 10% in US. Do I have a choice here in which currency I value the firm. i.e. Can I convert all future cash flows of the firm to USD and use an US WACC. If so, how do I account for currency fluctuations and the entailed risk? or should I be approaching this differently. Remember I used 90% - 10% as an example .. it could as well be 50% - 50%. Almost every company gets its cash flows in multiple currencies. You have two choices. You can pick a currency and convert all cash flows into that currency, which will require that you use differential inflation to forecast exchange rates, and discount at a cost of capital in that currency. Alternatively, you can value each currency stream separately and add up the values at the end. That will require that you estimate costs of capital in all the local currencies. Pick your poison. I recall reading about a research study done last year that found most sell-side analysts made errors using DCF and overvalued their companies by an average of 30%? It is too hard to do. If you really believe that equity research analysts do DCFs, you probably also believe in the tooth fairy. I think you are talking about Trojan Horse DCFs, at best, and Mutant DCFs, at worst. are there insights by VALE results today? I dont include share buybacks as a legitimate item in "Cash Flow to Equity". If Iam a shareholder who does not sell into the buyback - I receive no cash. presumably at some point in the future I will receive larger dividends due to the reduced sharecount if any, after executive stock option exercises are netted out. So - back to dividends. I distrust any analysis that uses "cash flow to equity" rather than "Dividends" in performing a valuation exercise. For a large swath of businesses that dont pay dividends, then , the challenge is to figure out when they might do so. That is the only useful valuation exercise. I guess what you are saying is that DCF valuation is more of an art than discipline. Having said that, your remarks about unit consistency are quite logical, however, the other two require significant judgement. Could you please share how to deal with those consistency checks from practical point of view? Which narrative is plausible, which growth rate is low or high relative to the assumed risk? How well does the concept pf "optimal debt equity combination" work (i.e. the financing principle) given that in real life it is the Banks that really dictate or insist on how much equity they want you to put up for your project before they approve and give you the Debt part? Can you please point me to any material on the internet that provides detailed instruction on how to convert a USD WACC to a Local Currency WACC.